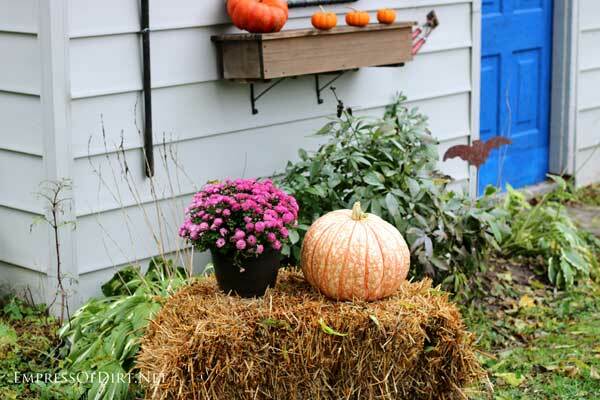 Because my shed is the focal point in the garden, I like to dress it up for the seasons. This is the autumn decor. You can see the original before and after makeover of the shed here. The headquarters for all shed ideas and information is here. No spending money: can only use stuff I already own or find. Cannot take longer than one afternoon to decorate. I knew I wanted to use this old garden gate as the focal point. It’s one of my favourite junk pieces and I love how it shows up nicely on the wall. I placed it in the middle, much like a window, and then went “shopping” in my home and garden for more pieces to add. I debated adding some plates to the long plate holder, but then, alas, I found my three old, doll carriage wheels fit perfectly so that was a done deal. Serendipity and garden art are best buddies. 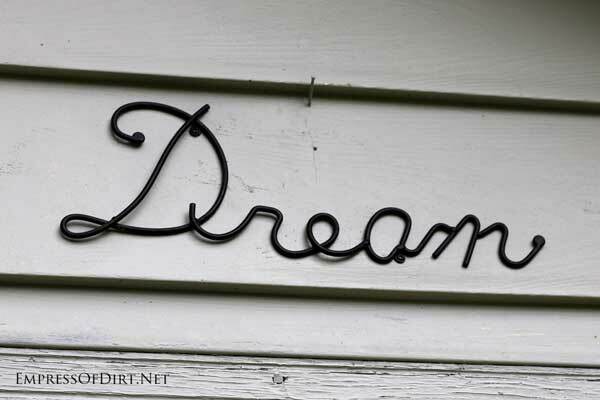 I’ve had this ‘dream’ for a very long time (punny). I think every decorated shed needs a sign, letters, or words as part of the scheme. 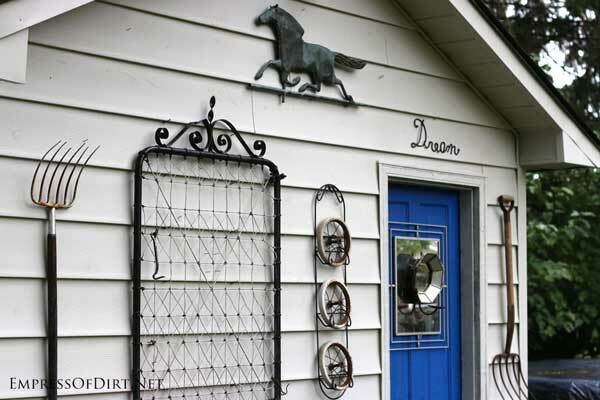 The horse is from a beautiful, old, copper weather vane my mom gave me. I don’t want to install it properly on a rooftop since we’re so prone to lightning strikes here, so for now, the horse will be featured alone until I figure it out. See the forky garden tools? Those are my favourites to collect. I love the long tines. I also like how it looks with one aimed up and one aimed down. 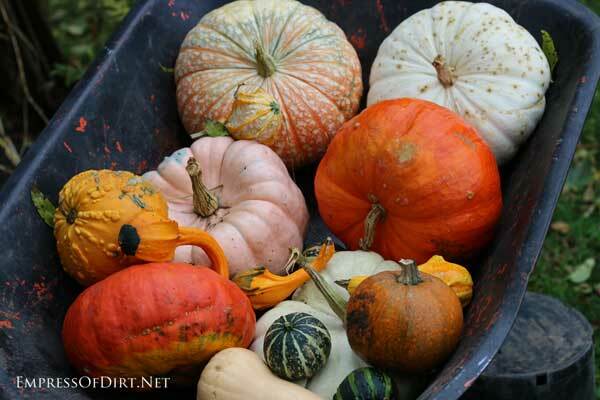 We were on a drive out of town and came across this fabulous garden nursery with a great mix of pumpkins and gourds. I could not resist all the sizes, textures, and colours. I’ve got them on display now but I’ll be using them for my entries in the The First Annual Crack-Me-Up-O-Lantern Pumpkin Decorating Contest. Stay tuned for that. I’m facing some pretty fierce competition so I’m not sure if I can pull off a win. 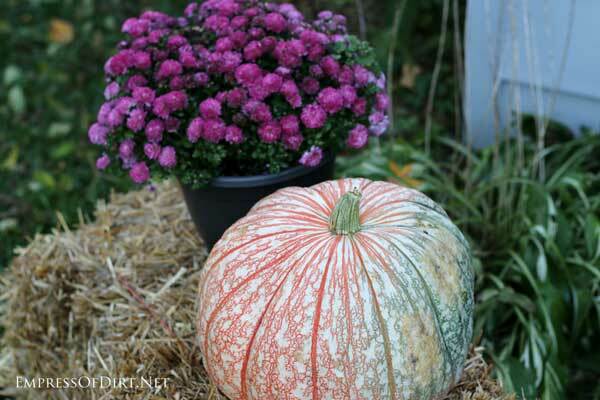 How beautiful is this variegated pumpkin? Fall is so beautiful. Why does it always have to lead to winter? 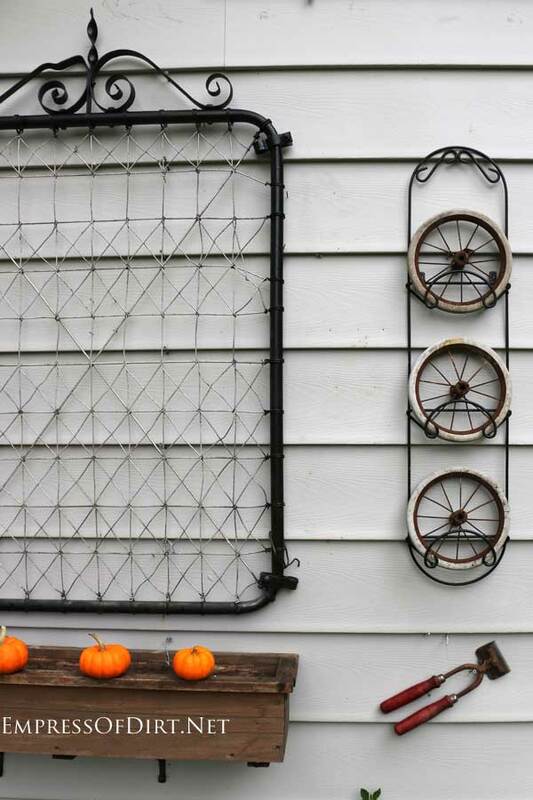 The straw is for covering some crops for the winter but for now it adds to the decor: It was fun putting this together, adding a piece at a time and then scrounging around the house to find the next thing to add. The wooden planter box came from someone’s trash pile. It needed some TLC but I was able to put it back together. Here’s the finished project. I’m really pleased with it. And wow, am I ever glad I finally painted the shed. 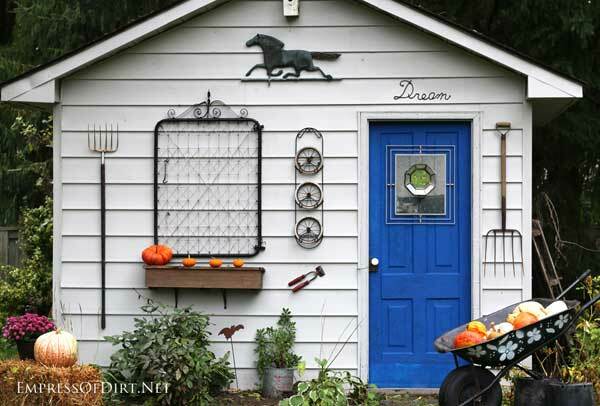 There’s lots more shed ideas here. I -uh- acquired two beautiful old gates similar to yours recently on a heavy trash pickup day…..they were so heavy that I had to carry them home in two separate trips and later told the neighbor who threw them out that they had a new home in my back yard! Why do I love junque?? 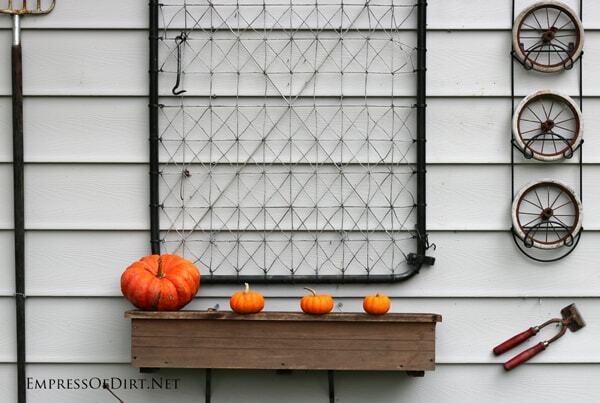 I love your autumn decorations on your shed. 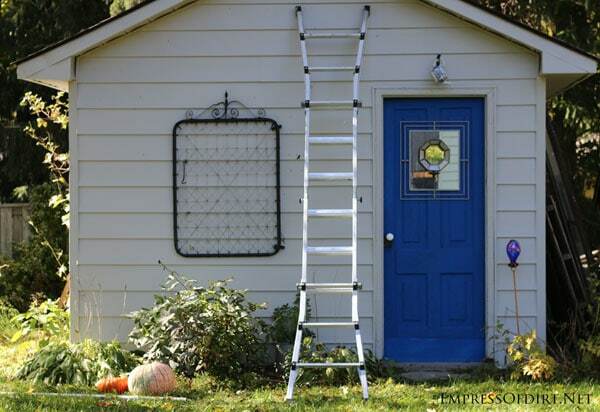 Question: How do you fasten heavy items to vinyl siding? Thanks for sharing your creativity with the rest of us. Hi Ada, The shed has a wood frame. I drill through the siding into the wood to hold supports in place. I do agree, Fall is far to short!! Felina, we must do something about this! 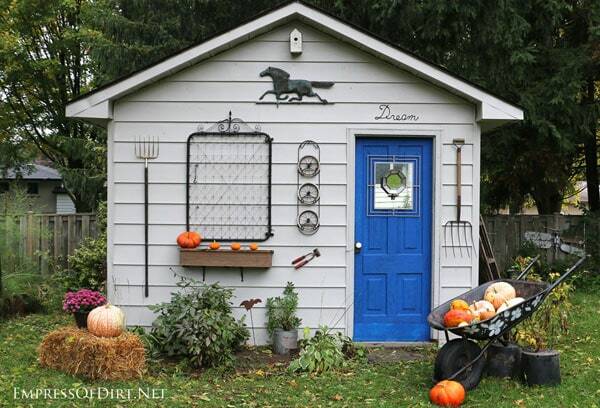 Melissa, I love your spruced up shed! That garden gate makes a great focal point. 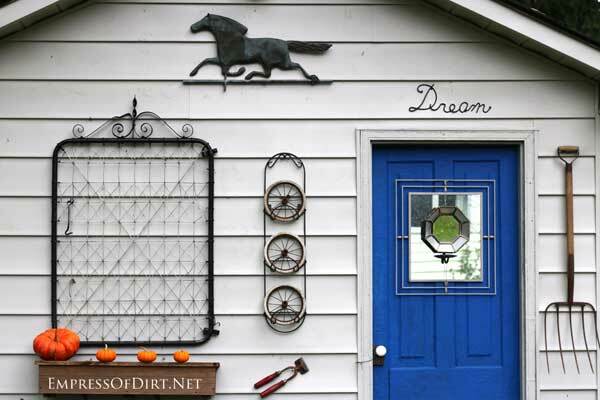 We have a few old garden tools that I keep encouraging Leo to display creatively on our shed. Guess I’ll have to take the “tools by the handles” and do it myself! Sounds like you have a fun project to do, Jane! 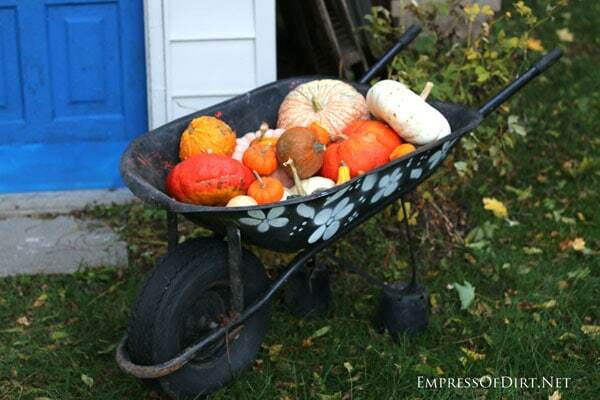 Looking all spruced up and very seasonal, Empress! 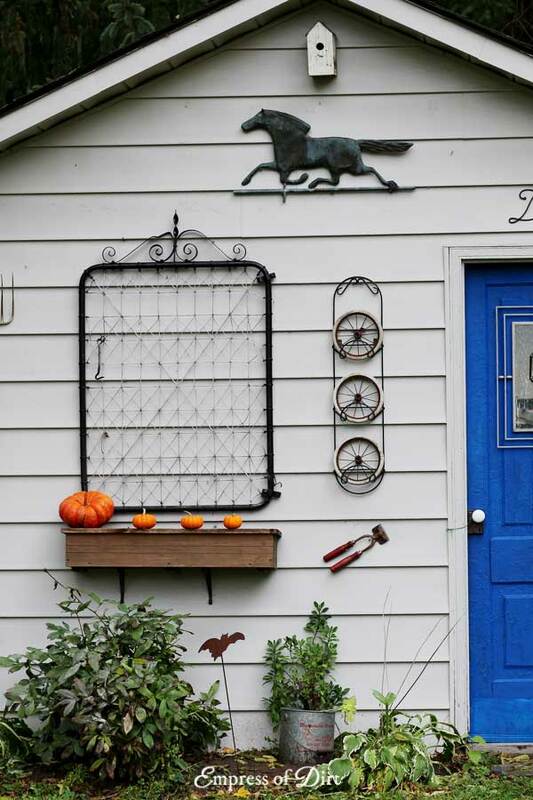 Love all the wonderful accents on your shed! Thank you, Ms Fairfield. Fun project, for sure!